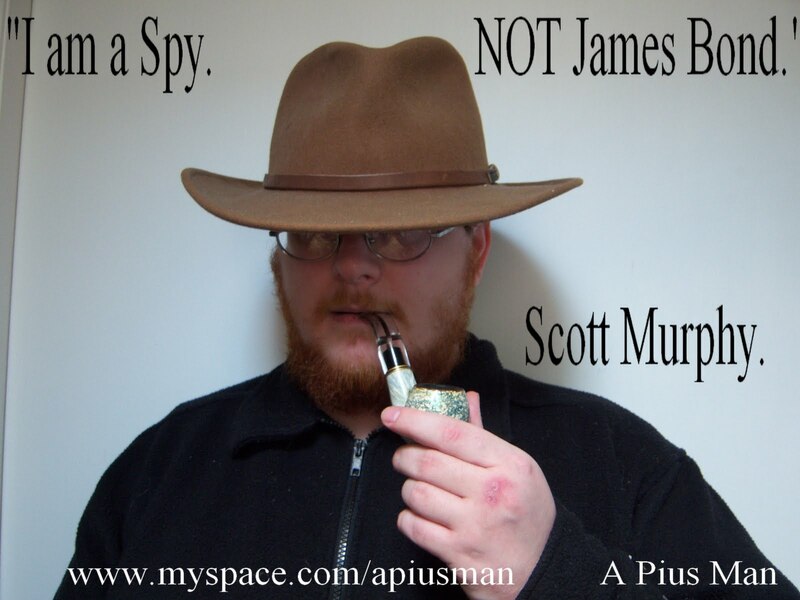 A Pius Geek: Building Character: Scott "Mossad" Murphy. Building Character: Scott "Mossad" Murphy. Two of the short stories posted on this site have, thus far, been about Scott “Mossad” Murphy. Mysteriously, they all seem to fit with the end product of Murphy in the novel. I think it helps that I essentially wrote a short biography for Scott, like I have for all of my other characters. The character becomes alive in my head, and all I need to do is drop him into a situation and let him play. Though it wasn't until I wrote Tinker, Tailor, Goyim, Spy that I realized how much of a stiff Scott really was. But, then again, I don't know too many party animals who want to be accountants when they grow up. And by the time of O Little Town of Bethlehem, I only just managed to hint at Scott's isolation. Not only did he not fit in anywhere in Israel, even his own office, he had just killed or arrested most of the people he had spent the previous three weeks with. At that attrition rate, it's hard to keep a long term friendship going. And then I started considering how much the character of Scott Murphy fit with the end product in the novel. Despite all of the new things I discovered about his character, and the more his past has developed in front of me, the puzzle pieces of his life still fit together. This story wasn't that hard to come up with. I had Scott's origin story in mind from day one. But it was just easier to tell it from the point of view of anyone but Scott, especially since the last sequence looks much more impressive if you don't see how that particular magic trick was done. And, as always, there was the problem of politics in regards to intelligence work-- not only between the government and Mossad, but the internal politics as well. Hence telling this tale from the point of view of Mossad Chief Imi Morgenstern (one part Imi Lictenfield, creator of Krav Maga, and one part Amy Morgenstern, one of my Krav instructors). One of the things I had to change about Scott was his age. When I wrote A Pius Man the first time, 2011 was the future. Things that were high-tech at the time can now be gotten as an app on the iPhone. Under the original rubric, where 9-11 happened when Scott was in college, at current rate of speed, Scott would be in his mid-30s by the time the book is published. So I had to make him younger. The Scott Murphy of my novel is smart enough to never need a gun, avoid every firefight, and plan in such a way that his plans are the weapon. So why shouldn't he have skipped a year or two of school? And if you're a workaholic, who had finished college courses in high school, college is not that difficult with a full courseload during every possible session. And being a workaholic is a good survival trait—he harder he works, the faster he could get out into the real world. Why? Because Scott had never been described as “attractive” in any physical sense, so he's isolated by looks, by youth, and by intellect (I know something about two out of three of them); the real world had more options for him. The faster he went through school and started reality, the better. To quote Isaac Asimov, beware the wrath of a patient man. So, making him younger fit in with the character. He was able to join Mossad after 9-11 to become the first member of the Goyim Brigade, and still stay in his twenties by the time A Pius Man (hopefully) gets published. If the book takes too much longer, 9-11 will have to happen when he's still a teenager. His career choice of "accountant" will have to be because his idea of fighting terrorism is to defund them, and steal their money with a pencil instead of a bank heist. But that's one rewrite I'd like to avoid. This was made up completely from wholecloth. I was originally going to do a Sean A.P. Ryan Christmas story in California, entitle it Coyote Christmas (little yappy dogs being fed to a coyote was part of it), but it didn't really mesh together well. Trying to make Sean appear neutral as opposed to violently deranged (in a bad way) or in some way heroic was too much to ask. As far as A Pius Man is concerned, Sean's alignment is Chaotic Neutral when the book opens. Oh, wait, Bethlehem is near Scott. For the middle of the story, I wanted everything to look like it was going to go straight to Hell. So it would work best if I just showed it from the terrorists' point of view. And for the end of O Little Town of Bethlehem, in addition to a wrap-up section that would explain how Scott managed to make everything happen, I had little hints of how cut off he is. He's working on Christmas morning, and he has nowhere else to go. This still fits. I had put into A Pius Man an offhand comment about times he had spent with women who the Mossad used in honey traps. They gave him details on wooing, and seduction, and other activities he wanted nothing to do with. Given Scott's unbending nature, that lesson plan may have had to start with several of those women tying him to a bed. The rest of the events would be as funny as hell … it would have an NC-17 rating, but it would still be hilarious. By the time of A Pius Man, Scott Murphy will have been a spy for years. He is isolated from the outside world by being a spy. He's isolated from the Mossad community by being a goy. His work will be his life. And then, one day he gets called to Rome … And then the fun starts. Bad Romance: How to be a Cynical Romantic.